November 15, 2018. Yokohama, Japan – Views of the sky were clear and the morning sun illuminated bridges across the Yokohama Bay as His Holiness the Dalai Lama walked to the teaching venue before the audience began to arrive today. Seated alone, His Holiness began the preparatory procedures for the Avalokiteshvara Empowerment he was going to give. Behind him hung a large appliqué thangka depicting Buddha Shakyamuni flanked by Nagarjuna and Asanga and another portraying Avalokiteshvara, Lord of the World. Beside him was small pavilion containing the Avalokiteshvara mandala. Once people began to fill the hall, the ‘Heart Sutra’ was recited first in Japanese, then in Korean, Chinese and Mongolian. “Good morning, today I’m going to give the initiation of the Great Compassionate One, Avalokiteshvara, Lord of the World,” His Holiness announced when he was ready. “Generally, I regard the teachings of the Buddha as being of two categories: the general structure that includes the sutra teachings from the three turnings of the wheel of dharma and special teachings given to specific groups or individuals. Today’s tantric empowerment belongs to the category of specialized teachings. “In India there was no division into old and new tantras, a distinction introduced in Tibet at the time of Lotsawa Rinchen Sangpo. In the old tantra tradition there are teachings belonging to the distant ‘kama’ lineage, the near lineage of ‘termas’ or hidden treasures, and the close lineage from visionary sources. 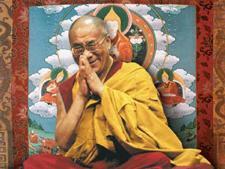 This empowerment is derived from the Secret Visions of the Fifth Dalai Lama. I received the empowerments from Tagdrag Rinpoché when I was very young and I have undertaken many of the associated retreats. “When we first came into exile we didn’t have a copy of the text, but eventually a copy came to me and since then, following the custom of the 13th Dalai Lama, I perform an offering to Avalokiteshvara on the tenth day of every month in accordance with it. In Tibet there was a celebrated statue of Avalokiteshvara in the Potala, another in the Jokhang, while a third was the Wati Sangpo or Kyirong Jowo in the care of Dzongkar Chodé Monastery. When the Fifth Dalai Lama undertook an Avalokiteshvara retreat he brought the three together and experienced visions of deities emerging from the heart of the Wati Sangpo. His Holiness spoke about the Nalanda Tradition and how it spread after Shantarakshita introduced it to Tibet. He mentioned that the Chinese pilgrim Xuanzang visited Nalanda University, where he studied and is reputed to have met Nagarjuna’s disciple Nagabodhi. Eventually the Nalanda Tradition spread from Tibet to Mongolia and the Russian Mongolian Republics of Kalmykia, Buryatia and Tuva. His Holiness observed that there had been a custom in Tibet of venerating a set of Indian scholars known as the ‘Six Ornaments and Two Supremes’, but it occurred to him that several prominent scholars were missing. Adding their names he drew up a new list of the ‘Seventeen Masters of Nalanda’ and commissioned a painting of them all. He remarked that Khunu Lama Rinpoché, Tenzin Gyaltsen had told him that several Buddhist masters were outstanding among Indian scholars and that texts like Nagarjuna’s ‘Fundamental Wisdom of the Middle Way’ and Dharmakirti’s ‘Commentary on Dignaga’s ‘Compendium of Valid Cognition’ were Sanskrit works of the highest quality. Returning to the question of visions and the Dalai Lamas, His Holiness mentioned that Gendun Drup, the First Dalai Lama studied with Je Tsongkhapa and was a dedicated practitioner who had visions of Tara. The Second Dalai Lama, Gendun Gyatso, had visions of deities from his childhood. Due to differences with Panchen Yeshe Tsemo he was unable to stay at Tashi Lhunpo Monastery that had been founded by his predecessor, and went to Drepung. The Abbot there had a dream of the Tenma Chunyi (The Twelve Protector Goddesses of Tibet) carrying a monk towards the monastery. He told the monks that someone was coming and that they were to welcome him. In due course, Gendun Gyatso became Abbot of Drepung and later Abbot of Sera as well. He had a strong connection to Palden Lhamo. “I once had a dream that I was on top of the Potala,” His Holiness explained, “and I could hear the poignant melody of Drepung’s offering prayer to Palden Lhamo. A voice told me that Gendun Gyatso composed it. Confusion is present in all (destructive emotions). However, he went on to clarify that since ignorance has no sound basis in reason, it can be defeated and along with it the problems to which it gives rise. His Holiness announced that he would give the lay-person’s precepts. He pointed out that the Enlightened Ones don’t wash unwholesome deeds away with water, nor do they remove the sufferings of beings with their hands, neither do they transplant their own realization into others. It is through teaching the truth of suchness that they help beings find freedom. They indicate the right path that it is up to us to follow. He also recalled that the Buddha hesitated to teach what he had realised after his enlightenment because no one would understand what he had to say. However, eventually explaining that “in the eyes of the noble ones this is true suffering…” he taught the Four Noble Truths. Later, during the second turning of the wheel of dharma, he taught the perfection of wisdom. The explicit meaning of those teachings was emptiness of independent existence, which Nagarjuna would be responsible for elaborating. The implicit meaning was how to make progress on the path, which Asanga clarified in the Five Treatises of Maitreya. 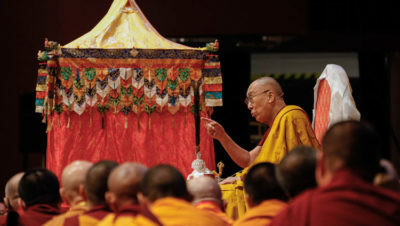 Before giving the empowerment, His Holiness gave an explanatory transmission of Je Tsongkhapa’s ‘In Praise of the Buddha for Teaching Dependent Arising’. He recalled that when Tsongkhapa left his native Amdo for Central Tibet at the age of 16, his teacher Dhondup Rinchen gave him clear advice on how he should pursue his education. Thus, he went to the Kadampa monastery of Sangphu where he engaged in philosophical studies and sat for exams. At Gadong he experienced a vision of Manjushri who would advise him thereafter. Subsequently, he was teaching a circle of followers when Manjushri told him to go into retreat. When Tsongkhapa expressed other people’s misgivings about his disrupting the teachings he was giving, Manjushri told him he knew better. Tsongkhapa entered into rigorous austere retreat with companions like Togden Jhampa Gyatso. His Holiness remarked that when he was young he memorized ‘In Praise of the Buddha for Teaching Dependent Arising’ in a single morning. Later, he received an explanation of it from the Kinnauri master Gyen Rigzin Tempa, who had received it in turn from Khangsar Dorje Chang. When he had completed his reading of the text, His Holiness embarked on the Avalokiteshvara empowerment to which the members of the audience gave their rapt attention. Having concluded two days of Buddhist teachings, he made a point of waving to the audience in different parts of the hall and reaching down to outstretched hands at the front of the stage as he prepared to leave. Tomorrow, he will take part in a dialogue on modern science and Buddhist science.